Contrary to popular belief, the "88" was first used as an AT gun before WWII, during the Spanish civil war. During the Battle of France, this weapon was the only German AT gun that could penetrate the heavy Matilda II armour. It was so feared by the allied tank crew that any big guns spotted on the battlefield were called "88" by them, including the Italian 90mm AA gun. Not really good for air, has extended range 20, not enhanced range 20, so air can only be hit within 8 hexes. Pair this with 3 ton trucks and MG42s and it is impossible to lose(except by infantry artillery). On open ground, this thing can be pretty nasty against allied armor. 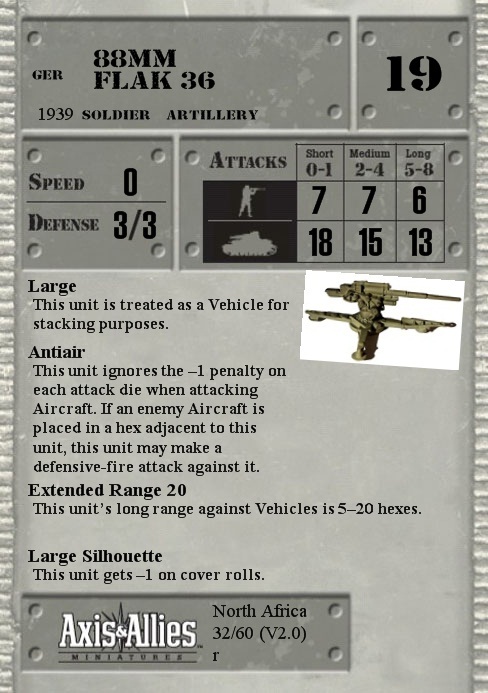 However, as it cannot move by itself, you must invest money into a 3 ton truck or two, or this unit's effectiveness will probably be hampered significantly… But, what with being such a low price, you can easily take two 88s with two or more trucks and come in at a price equal to or lower than that of any of the Tiger tanks. Very, very powerful unit if used right.